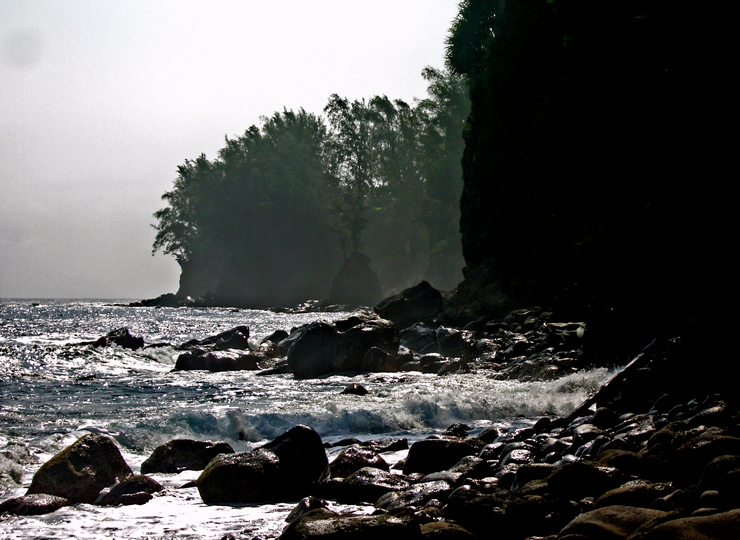 Surprising, wild, lovely, peaceful Kolekole Beach Park is the jungle gem of the Hamakua Coast beach parks. 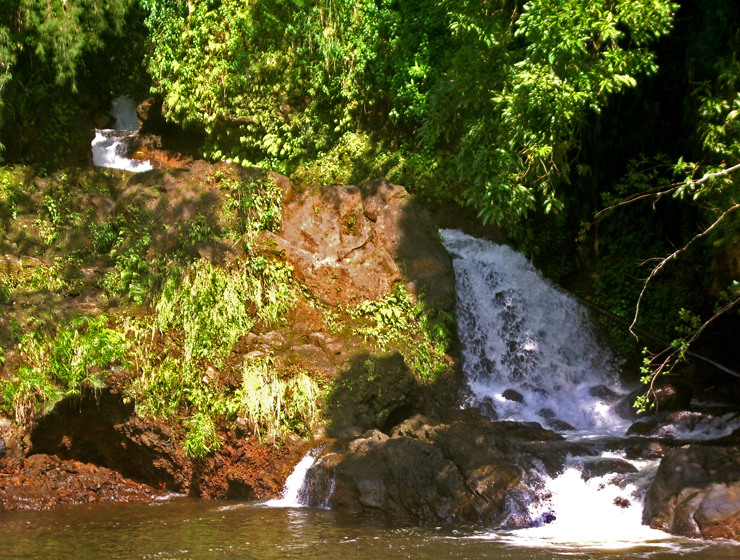 The river you saw magnificently jumping with such abandon off the cliff at Akaka Falls ends its journey to the sea by sluicing down through this Koa and palm tree filled gulch and smashing into the surf at Kolekole Beach Park. Neatly hemmed on three sides by dense jungle canyon, Kolekole features lawns, picnic facilities, and a water-fall festooned swimming hole, all leading the visitor to the pounding, cobble beach in the furious surf. 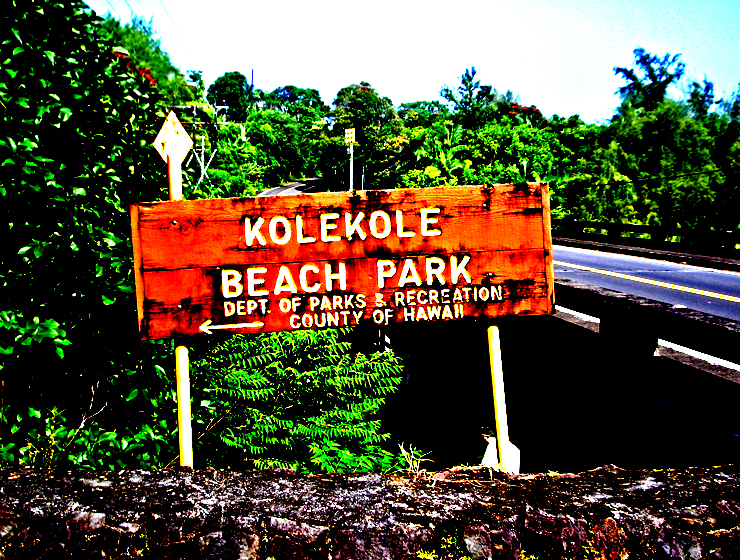 Kolekole Beach park is located just north of mile marker 14 on Highway 19; the narrow access road turns sharply uphill just before the massive bridge over Kolekole Gulch. 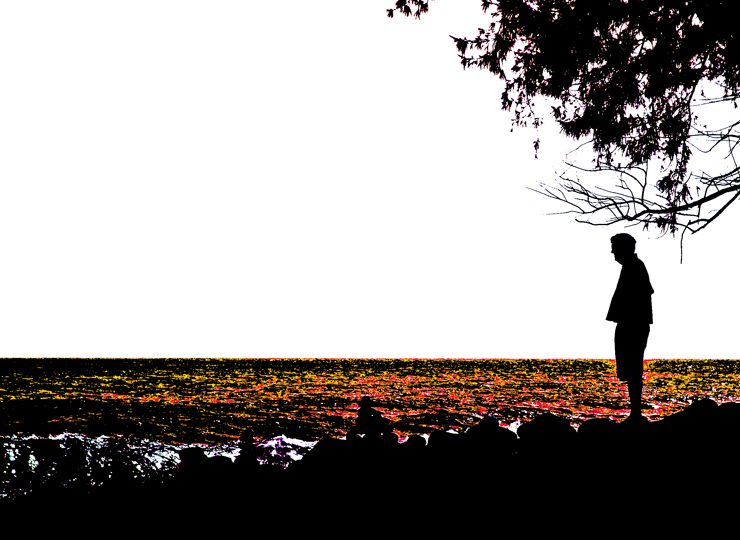 Kolekole means “raw” or “scarred” in Hawaiian suggestive of the raw gash of Kolekole Gulch, but the term has come to mean “talk story” in pidgin and that is what locals come here to do, “talk story” with friends and family as the fish, surf, barbecue and relax. The lovely, jungle-draped access road tumbles down the steep slopes of Kolekole Gulch to the side of Kolekole Stream, which rises at about 8000 feet on eastern slope of Mauna Kea, flows over Akaka Falls and then down to Kolekole Beach. 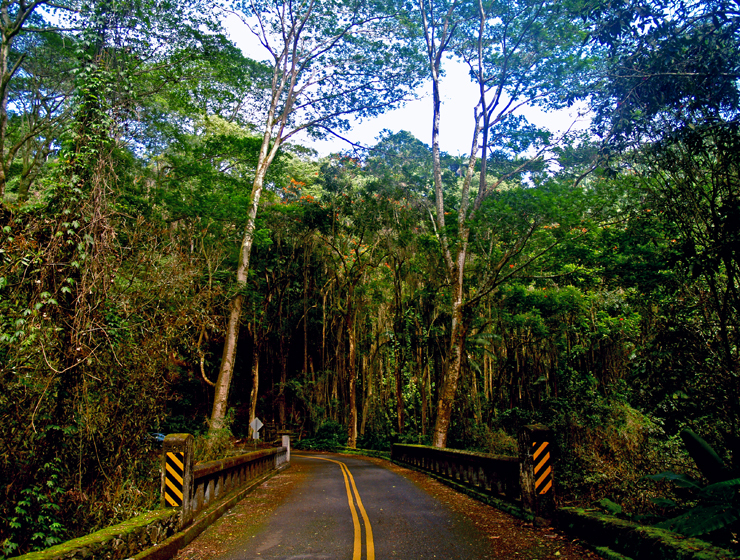 In addition to the koa trees, varieties of palm, banana, fern and liana vine and lots of orchids can be found along this road, growing down to the river. A remnant of the Old Mamalahoa Highway turns off from the access road at the bridge over Kolekole Stream, and runs through the incredible jungle all the way to Hakalau Gulch. This section of road used to be a very scenic drive until the earthquake of 2006 rattled the depression-era bridges. 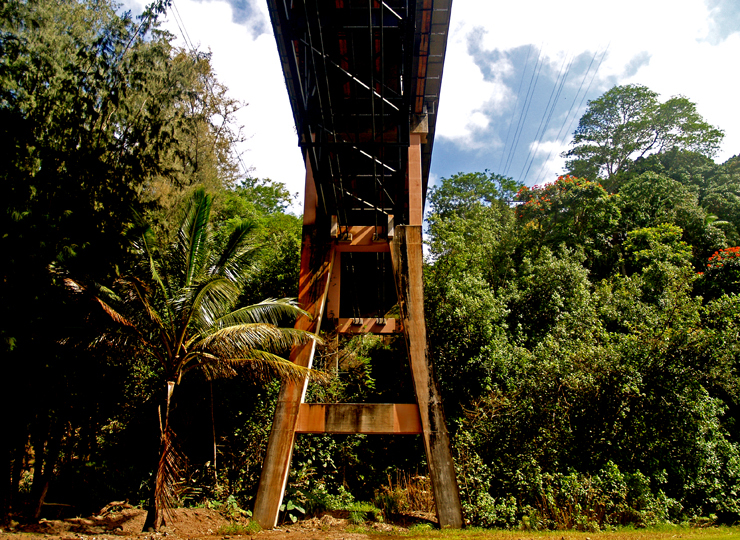 That huge, 100 foot high bridge that spans Kolekole Gulch, running over the park at the mouth of the stream, was originally built by the Hawai’i Consolidated Railway Company as a railway bridge. Debris from major damage to the bridge by the tsunami of 1946 are visible underneath, even today. Damage to this, and the other bridges up and down the Hamakua Coast forced the closure of the railroad line. 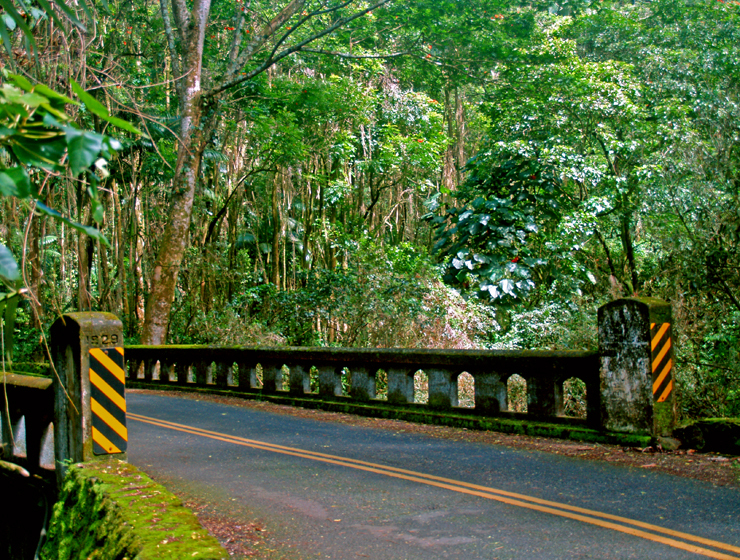 The bridges had been repaired and rebuilt for automobiles by 1949, opening the connection between Honoka’a and Hilo once again. Although locals surf and swim unconcernedly here, the visitor is advised to admire the water, but not go in. 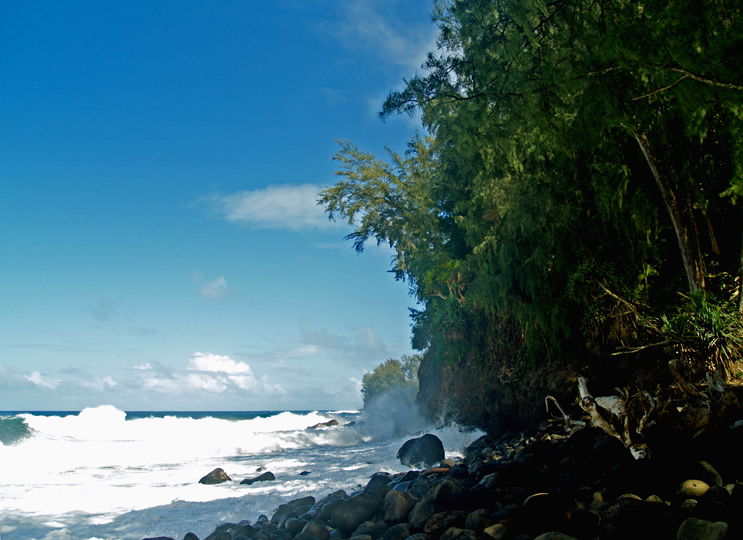 Not only are the currents and tides lethally treacherous here, but stream mouths and murky water are prime hunting grounds of Hawai’i’s own tiger, Mano, the shark. 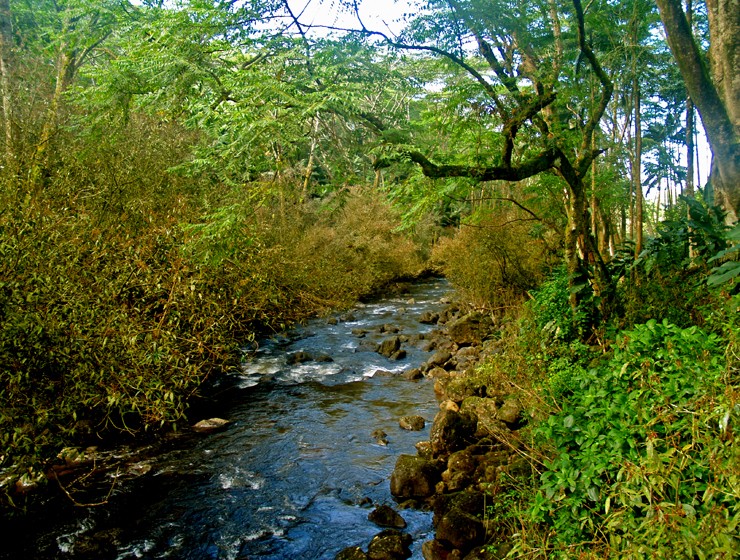 Remember that most all Hawai’i streams are infected with leptospirosis and giardia; do not drink from the streams, do not allow stream water to get into your mouth and do no attempt swimming in the stream if you have any open cuts or scratches. 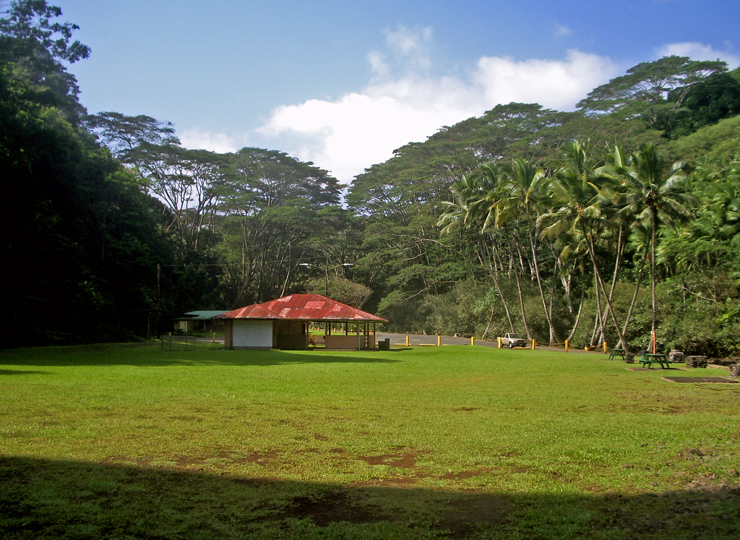 Facilities at Kolekole Beach Park include picnic pavilions and tables, pit barbecues, showers, restrooms. There is no drinking water at the park; remember to bring your own. Camping is available by permit only; details are available here. The park can be crowded on weekends but is generally deserted during the week.